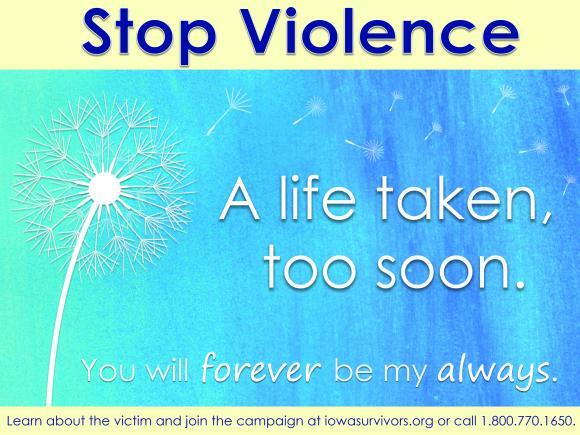 The Stop Violence Project is a collective effort to raise awareness to homicides in Iowa. Individuals, businesses and organizations can purchase a sign to raise at different times throughout the year in memorial of those lost to homicide. Each Homicide & Violent Crime Program has suggestions for when to display signs. Signs are $20 each and can be purchased from your local program. For help finding your local program, please contact us. When you purchase your sign, your local program will share more information with you about when they display the signs. Below are some special dates that would help raise awareness to the project, or are special designated memorial dates. If there are dates that are special to you, we welcome you to display your sign. Thanks for supporting this important project and helping us remember everyone that we’ve lost to homicide. If you visit the Iowa Homicides & Other Violent Crimes website, at www.iowasurvivors.org, you can also add a tribute to a loved one lost to homicide.